One of the major keys to freelance writing success is finding magazines to pitch. Without magazines to query, you won’t get assignments—and if you can’t get assignments you don’t get to write your stories or get paid. Most beginning (and, I suspect, veteran) freelance writers find assembling magazine lists the most onerous part of the trade. I get it. Spending hours surfing the Internet for viable magazine leads and copying down editor’s names and contact details is a daunting task. Many writers find this process so boring they skimp on this critical aspect of freelance writing. And it costs them big because they miss out on many magazine leads that could potentially buy and publish their stories. Fortunately, there are plenty of primary resources online where you can find magazine leads. Here’s a list of websites that will direct you to a plethora of magazines. Check them out—you’ll be amazed at how many more magazines are out there, just waiting for you to discover. Some of these lists require you to visit the magazine’s website for their writer’s guidelines, and editor’s name, and contact details. You’ll get the name from the list but you have to do some legwork. Others charge a monthly or yearly subscription fee. Do you need to subscribe to them all? No, of course not. You can subscribe to one or two that best fit your needs, and try them out. Amazon.com has a resource with magazines in most genres including travel, City & Regional, Women’s Interests, Science, History & Nature, Home & Garden, Parenting & Family, Lifestyle & Culture, Automotive & Motorcycles, and many, many more topics. Book Market has a short list of top shelf travel magazines, in-flights, transportation, and regional & city publications. Create your own personalized custom list of U.S. travel magazines on easymedialist.com. You have to pay for this service. I haven’t spoken to any freelance writers who have subscribed, but the lists are very comprehensive. You can also purchase the top U.S. newspaper lists, alternative, and city and state local media lists here. This is the website for media/advertising company Echo Media. You’ll find plenty of travel and specialty magazines listed here. Magazine circulation figures are also given—handy to know when you’re applying for complimentary travel, accommodations, meals, tours, guides, etc. Freecycle.org is a free service network of 5,000 groups with nine million members globally. Here, members post “wanted” ads and “offers”. For example, if you need some back issues of a particular magazine for your research, you can post a “wanted” ad requesting them. Freelance Writing Gigs is a handy dandy list of 65 primarily non-travel print magazines that are looking for freelance articles. Includes wine, food, tea, coffee, in-flights (10), golfing, and spa magazines. issuu.com is a digital network that creates and publishes magazines online. Dozens of them, hundreds of them, thousands of them! It’s a cross between a magazine archive, a library, and a newsstand. It’s fun scrolling through their mind-staggering selection of magazines looking for potential recruits for your travel distribution list. And you can even ‘open’ the magazines by clicking on their covers, and read them. Opening these magazines will provide insight into their editorial content and the editor’s name & contact details—very helpful when you’re researching a new magazine to pitch. You’re going to finds magazines here that you never even knew existed! There’s an unlimited number of travel & lifestyle magazines here for you to get your teeth into. And I do mean unlimited. This comprehensive list of magazines includes a huge number of travel & lifestyle magazines. In a half hour ‘scrolling session’ I found the following travel magazines: View Travel & Lifestyle, Best in Travel, Travelite, Experience Travel & Living, Good Mood Travel, and Travel Ideas. This list warms my freelance writing marketing heart. If ever there was a mother lode online, this is it! Magazine-agent.com is another excellent source of 115 print travel and regional magazines. Scroll down the left-hand column to find magazines in many other freelance writing genres. Other magazine categories listed here include cooking, food & beverage, history, home & garden, photography, science & nature, and women’s magazines. Great list of magazine markets here! Free! What more do you want? Go there now! NextIssue.com gives you access to 200 different magazines (plus their back issues) for $9.95/month. The magazines listed are mainly the popular top shelf glossies like Travel + Leisure, Sunset, Afar, National Geographic Traveler, Saveur, and others of that ilk, so if you’re a beginner with few or no bylines, you might want to build your street cred before you subscribe. On the other hand, novice travel writers might consider subscribing to this service just to be able to read some of the finest travel journalism in print. NextIssue.com offers a free trial. The useful website whopayswriters.com lists many general magazines, newspapers, and online e-zines, and what they pay freelance writers. Each post is from writers who have written for magazines, with details about word length and rate of pay. Some posts list how long it took the editor to pay up, and a few note what sort of rights the magazine buys. The magazines and newspapers are listed alphabetically, so if you're looking for specific publications they're easy to find. 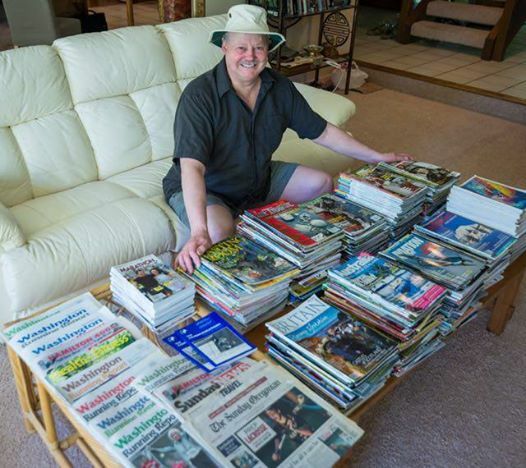 There are multiple entries for many of the magazines listed here. This is a good thing: you get a better overall ‘feel’ for the magazine and what it pays from multiple listings. There are a few travel magazines listed here. The pay rates range from a few cents/word to $2/word. There’s something here for everyone, from the beginning freelance writer to the well-published veteran writer who just targets higher paying magazines. WorldwideFreelance.com is a paid subscription service that "provides one of the largest online databases of freelance writing markets. Discover writer's guidelines for 2,500 publications." "Today, our database lists more than 2,500 freelance writing markets with two levels of access. Everyone can browse 700 markets free of charge. The more serious writers can become Markets Plus members and gain full access to 2,500+ markets." The w3newspapers.com list of travel magazines covers adventure travel, tours, vacation needs, attractions, camping, popular destinations, island travel, cruises, traveler free tips, and more. “The Essential Online Tool for Writers. If you're serious about selling your work, meet your new personal assistant: WritersMarket.com. With a subscription to WritersMarket.com, you can easily locate new, up-to-date markets for publishing your work, get expert "insider" advice, and track your manuscript submissions and publishing contracts. Angela Hoy at WritersWeekly.com offers magazine market reports here. You’ll find some travel magazines, and many other genres. Another U.K. reference that lists regional and national magazines and newspapers in the U.K. and Ireland. Yet another U.K. reference listing regional and national newspapers, and magazines. This is the biggie! At least for North America. More than 20,000 U.S. and Canadian consumer and business publications in 260 categories! Yes! Seriously! The largest source of North American print magazines. Each entry contains address, phone, URL, staff names, editorial description, target audience, circulation details, & more. Indexed by publisher, title, and geographic area. The National Directory of Magazines lists magazines not found in directories elsewhere. Who says print media is dying? This big bad boy proves that print media will be around for a looong time. The catch: this big bad boy costs $995. For serious, professional freelancers only. Catch #2: The most recent edition is 2013. Other Trade Journals can be found at . . . 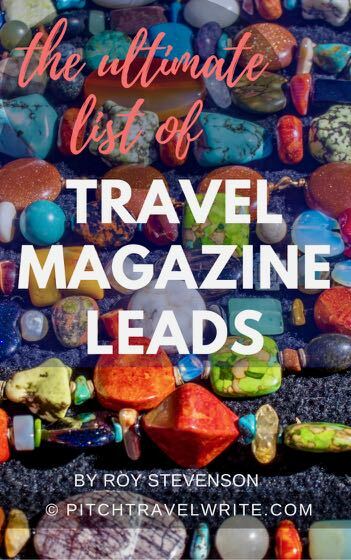 The reason I've been so successful selling my story ideas and getting my articles published is because I have huge lists of travel magazines to pitch. Being wired a little differently than most people, I actually enjoy the hunt for new magazines and have HUGE distribution lists. To help novice travel writers lay a foundation quickly, or to expand their magazine lists, I’ve published a reference manual, 100 Print Magazines That Want to Publish Your Travel Articles. I’ve also published a guide for online magazine leads. Fifty Websites that Want to Publish Your Travel Stories includes a quality list of websites where you can pitch your articles. Websites usually don’t pay writers for their articles, but it can be a good way to collect a few bylines if you’re a beginner. I’ve also published some other VERY helpful travel magazine list resources on this website (PitchTravelWrite.com). They show you how to plan your magazine search.